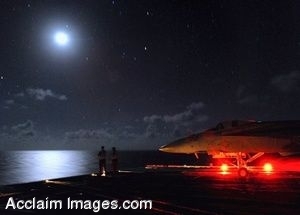 Description: Clip art photograph of sailors Aboard the USS Abraham Lincoln at Night. Sailors assigned to the Nimitz-class aircraft carrier USS Abraham Lincoln (CVN 72) enjoy a clear night from the bow of the ship during a pause in flight operations. Lincoln and embarked Carrier Air Wing (CVW) 2 are on a scheduled seven-month deployment to the U.S. 5th Fleet area of responsibility. (U.S. Navy photo by Mass Communication Specialist 2nd Class James R. Evans) Clipart photograph by Department of Defense Public Domain.